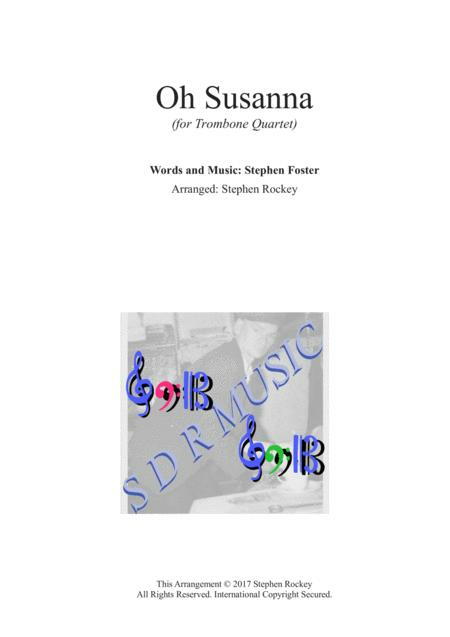 Composed by Stephen Foster (1826-1864). Arranged by Stephen Rockey. Romantic Period, Old-time. Score, Set of Parts. 26 pages. Published by Stephen Rockey (S0.232755). Stephen Foster's Oh Sussana arranged for Trombone Quartet. This starts with the traditional song, then into a waltz, and finally as a scherzo. This is much harder than it looks, but, is great to listen to, and great fun to play. Parts are in Tenor and/or Bass Clef C, and also Trb 1,2,3 transposed in to Bb Treble Clef.